Although I completely dropped the ball on remembering to highlight my steps towards this particular challenge I’ve well and truly exceeded my personal goal which was to attain the Daring and Curious level of the challenge by reading 5 books. When I look back at my reading for the year I’ve read 19 books which would count towards this challenge, which apparently makes me obsessed heading towards bookaholic status, though some have been counted towards other challenges too. Anyway it looks like I’ve rediscovered my historical fiction mojo after a few years in the wilderness which makes me happy (thanks once again to Norman for reigniting my interest). I’ve learned something interesting during this year. Although I like to think myself fairly adaptable to a wide variety of writing styles I don’t seem to cope too well with historical fiction which uses modern language. I understand why authors choose this option, especially for books set in times or places where the language is far removed from modern English, and intellectually I am in complete agreement with their choice. But when reading I like to get lots in a story and I find it hard to get lost in historical fiction which uses modern language. I know it’s silly of me. I wouldn’t understand a word of Ancient Greek if it were written in front of me so it shouldn’t matter whether a book set in that time uses today’s English or yesterday’s but, on some level that I can’t seem to overcome, it does. I’ve listed all the books below in the order I read them and notice I really got hung up on historical Australia in the second half of the year. It wasn’t particularly intentional, though I was reading books eligible for some awards here and historical fiction often does well here. I’ve put a star next to the ones I rated 3 stars or more (which on my scale means that I enjoyed reading them and would happily read something similar again). If I had to pick a favourite it would be a toss up between Geraldine Brooks’ Caleb’s Crossing and Ernesto Mallo’s Needle in a Haystack (two very different books). 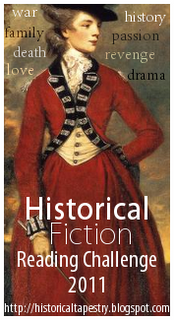 This entry was posted in 2011 Historical Fiction Challenge. Bookmark the permalink. Hi Bernadette, thanks for the summary and the ‘stars’. I don’t know how you manage to review so much, but I’m glad you do (think bookaholic status has been achieved!). Look forward to seeing next year’s choices! Bernadette – Well done you! And I have to say that I agree completely with your feelings about using modern language in historical fiction. Thanks for your summary of what you’ve read (not that I need to add anything to my already overburdened TBR!). I love historical fiction. I will try and read more this year I think. And a good point about language. My Danish novel, “Anna Märklin´s Family Chronicles” has a thread which takes place around World War I, and though my language is hardly authentic, I try to stick to a fairly conservative style and vocabulary. Yay for finding your historical fiction mojo again! I seem to have lost my mystery mojo. The only ones I have read this year as far as I can remember were historical mysteries. Not many contemporary ones at all. Thanks so much for participating in the challenge this year. I am glad you enjoyed it. Good job Bernadette. A goal to emulate. I see that Cora Harrison’s book is counted toward the Irish Challenge, but it sort of double-counts on this one. Although this isn’t my favorite genre, the Ariana Franklin books woke up historical fiction for me, at least for Adelia Aguilar. And I see many other good ones to read right here. I can’t wait to read your Rebecca Cantrell review. Her books sound compelling, but I try to stay away from WWII books, as even opening up a bit of that horrific history opens up too much for me. (My Jewish grandparents’ city in Poland, a cultural center, was decimated, about 100 Jews remain.) But if Cantrell’s books aren’t too much about the horrors, they might be o.k. But I’ll read your review and decide. On to a Great New Year of Reading Global Books! Good for you, Bernadette, and I’m impressed by your range in times and cultures — I’m hopelessly trapped in the 20th century. I know what you mean about language; I get really annoyed when they use a word or tool or something that wouldn’t even have been invented yet. A little research, please. It is always a pleasant surprise to look back and discover that many books that you read can fit so many reading challenges! 🙂 Well done this year of going historical!